QUALCOMM Incorporated QCOM recently announced that as part of its previously announced $30-billion stock repurchase program, it is going to buy back an aggregate of $16 billion worth of its common stock. To that end, this U.S. chipmaker has entered accelerated share repurchase (ASR) agreements with Bank of America Corporation BAC, Morgan Stanley MS and Citibank — which is a subsidiary of Citigroup Inc. C.
Following the news, its equity price has climbed 4% during yesterday’s trading session and eventually closed at $74.61. Initially, Qualcomm expects to buy back approximately 178 million shares in aggregate. However, the final figure will be based on the volume-weighted average price of the company’s common stock during the term of the transaction, less a discount and subject to adjustments pursuant to the terms and conditions of the ASR Agreements. The company has added that it is funding the ASR with its existing cash balance. It is on track to complete the majority of its broader repurchase programs by the end of fiscal 2019. Management remains committed to returning money to shareholders through share repurchases and is likely to continue investing to create long-term shareholders’ value. It seems that Qualcomm is trying to compensate investors for the failure of its $44-billion acquisition of NXP Semiconductors N.V. in July, due to Chinese opposition. The company is one of the largest manufacturers of wireless chipset based on baseband technology. It has been trying to retain leadership in 5G, chipset market and mobile connectivity, with technological achievements and innovative product launches. 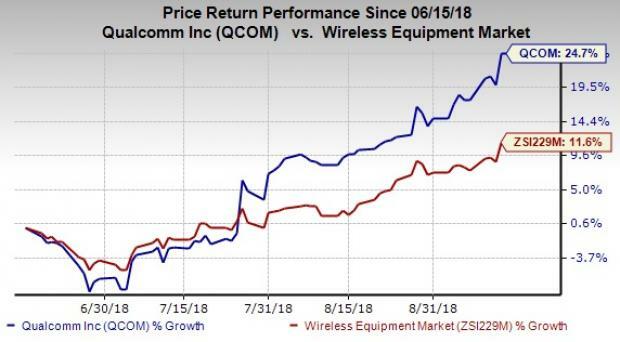 Over the past three months, shares of Qualcomm have gained 24.7% compared with 11.6% growth recorded by the industry. Qualcomm currently carries a Zacks Rank #2 (Buy). You can see the complete list of today’s Zacks #1 Rank (Strong Buy) stocks here.